There are a lot of P2P cars hare and it takes a while to get going but once it does there is a steady stream of activity. The casing is sent off to be welded and on it’s return the weld is not deemed to be good enough. They welded the outside but left the crack showing on the inside so it is sent back to be redone. The problem being that when the inside is welded it then needs about 2 hours of patient and fiddly grinding down to make it smooth inside. New bearings were sourced and fitted..The exhaust is remodelled – we now have back boxes from a van – and an additional skid plate welded onto the rear boxes for additional protection. By around 7.30pm I head back to the hotel as I (luckily) have the excuse of this biog that is way behind schedule. I expect to see Matt at about 10 or so as they only have the rear welding, change a couple of shocks and cut the wings. 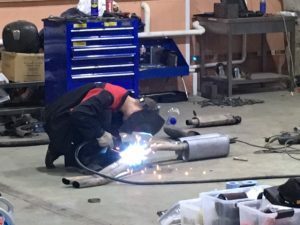 Matt drew the short straw – once attached it was cleat that the impact had bent and damaged the exhaust system around the point where it joins the block. The exhaust was removed, reshaped, new gaskets etc etc several times before the mechanic (actually we had the owner) was satisfied. At 3.30am with everything finished (no new shocks at the front – they delivered rear shocks – so we soldier on with the Jag originals) and with Matt desperate for a short few hours in bed the owner insisted on jet washing the car. Though I think that this was so he could add BOSService stickers to the rear of the Jag.. 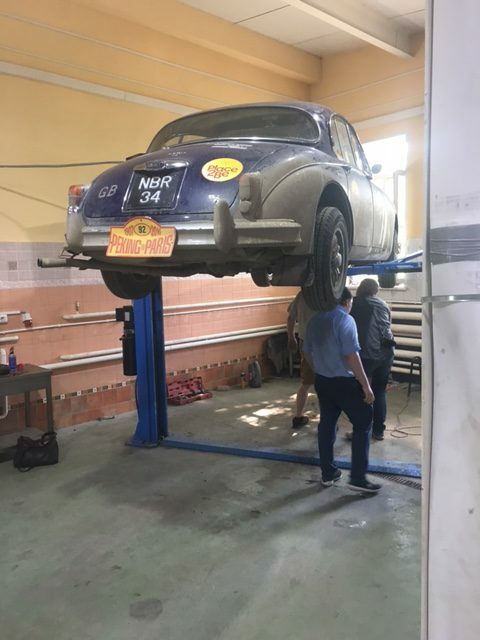 They stayed until 4am, fixed the car, supplied parts and washed it – for $700. So we are very happy to advertise them on the rest of our journey. We haven’t been able to seriously road test the car (it was 4am) so we hope the repairs will last but as it stands we are on the start line tomorrow morning on time. Luckily we remembered to check in when we got to the hotel last night so we have still got all the start and finish times for every day signed off. Sadly, yesterday cost us the Gold medal (that needs all the interim daily Time Checks and Time Trials etc signed off) which is a shame and shows just how difficult it is to win one. Ours was not a lack of car preparation or poor driving or navigational skills but the sheer bad luck of our car dipping down just as a piece of metal bounced up. To last 14,000km and 36 days without any bad luck is unlikely – but we had hoped to get a little further with Gold intact (well to Paris in fact) . We are 28th in the Classics section out of 57 and 3rd in our class – both positions might be affected by Day 13 though. If today’s repairs hold up and if we can get the suspension issues improved as we cross Russia then we are in a good position to claim a few more places on the tarmac of Europe – the South of France, Italy, Switzerland and Paris is more our cars spiritual home than Mongolia and Siberia.